Adopt the teacher evaluation model that does more than measure teacher effectiveness: it provides a tool to develop teacher effectiveness. States, districts, and schools across North America choose to implement the Marzano model for its credibility, its emphasis on what happens in the classroom, and its usefulness as a tool to develop teacher efficacy. 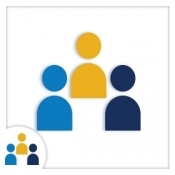 This whitepaper outlines the model and includes significant implementation tools. The Marzano Teacher Evaluation Model examines 60 elements designed to inform the instructional practices of teachers across four domains. Choose a model tested in the literature and in practice. The Marzano Teacher Evaluation Model was designed using thousands of studies conducted over 50 years and published in books that have been widely used by K–12 educators around the world. In addition, Marzano Research’s action research to perform experimental/control studies on the model have established more direct causal linkages with enhanced student achievement than can be made with other types of data analysis. Learn how this model can transform teacher evaluation into teacher development for your school. This tool can help evaluate your own growth and areas you may better prepare for or study . This tool will really help you improve in areas that you feel you are not so good at. As well as making you shine and influence others, in your school. For those whose real purpose is to excel in educating in improving themselves as well as influencing there environment. This great resource will make you reach your full potential !!! I absolutely think this is the best tool. It comprehensive, and it make a lot of sense (Researched Based in every way). I believe as other schools around the country learn about Marzano Evaluation Tool, they will be impressed. GREAT WORK!! 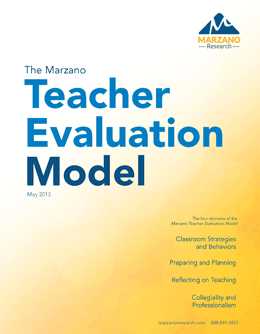 The Marzano Teacher Evaluation Model is a complete evaluation tool. This model describes each element thoroughly. It also provides the information necessary for the administrator and the teacher to be able to develop goals, provide immediate feedback and self-reflect. This evaluation model has the focus on building teacher capacity.